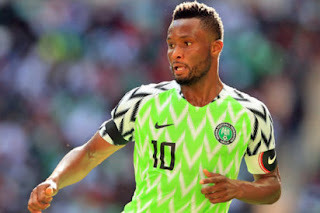 By Dennis Agbo ENUGU- ENUGU state police command has rescued Chief Michael Obi, father to Nigeria’s soccer skipper, Mikel Obi. Chief Obi who was abducted on June 29 along Enugu- Makurdi road was rescued inside a forest in Udi local government area of the state on Monday afternoon. The state police spokesman, Ebere Amaraizu said the police through its operatives of the 9thmile Division on Monday at about 2.30pm rescued Chief Obi and his driver, Ishaya John, unhurt in Egede-Udi forest, along old Egede Affa road in Enugu state. “They were rescued hale and hearty and pa Michael Obi and the driver have rejoined their family,” said Amaraizu. The police spokesman said both men were allegedly abducted on their way from Jos Plataeau, in a grey colored Toyota pardon jeep with registration number MUS 604CG and taken to unknown destination through the thick forest part of the area. Amaraizu said that the abductors started making calls to demand a ransom of 10 million naira before the operatives acting on intelligence information swooped on them where a gun duel ensued which forced the hoodlums to abandon their victims inside the forest and they were promptly rescued. 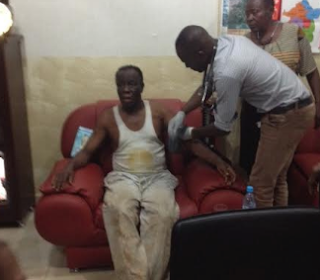 Chief Michael Obi, father to footballer, John Mikel Obi, receiving medical attention in the office Enugu state commissioner of police, Danmalam Mohammad shorty after being rescued from Abductors in Enugu. He further stated that Chief Obi extolled the response and efforts of the police which led to their rescue. “He thanked the commissioner of police Danmallam Mohammed and his operatives insisting that he is happy with the operatives performance. “I am alive and healthy.I thank the commissioner of police and the police operatives on their efforts which led to our rescue,” Amaraizu quoted Obi. He said that at the office of the commissioner of police, a team of doctors from the police medical unit conducted medical check on Chief Obi and also confirmed that he is hale and hearty. He appealled to members of the public particularly hospital owners and operators to watch out for any one with injury or wound believed to be that of bullet for prompt necessary action, adding that full scale investigations have commenced into the incident .